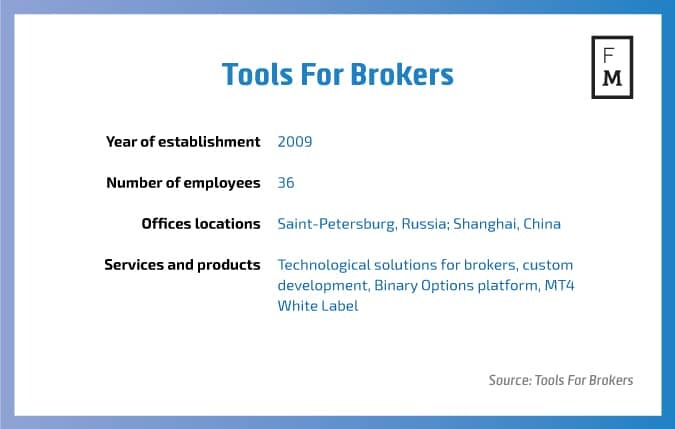 Alexey Kutsenko, founder of Tools For Brokers, shares with us his thoughts on the online trading industry. Finance Magnates sat down with Alexey Kutsenko, owner and Chief Executive Officer of the forex technology provider Tools for Brokers, to speak about his vision for the company and more. Almost a decade ago I started my career at a brokerage company. Having an engineering background, I was really inspired by the fintech industry from the very beginning. I worked in dealing and technology departments and quickly climbed the career ladder. After 3 years in the position of head of technology I decided to open my own technology company- Tools for Brokers. Our main focus is the expansion of operations in the leading centers of the forex industry. In particular, we are actively developing our business in Asia. We recently opened the new office in Shanghai and have already starting receiving the first yields from it. Our work has been acknowledged at the China Forex Expo, where we received an award as the best technology provider. After strengthening our position in China we will move to other markets. We hope that our office in Shanghai will be a gateway to Asian markets. I personally believe that physical proximity to clients and face-to-face meetings will facilitate our business relationships. Although we are experiencing the growth and transformation of our business, we are not losing our individual approach to clients. This could be considered as our major competitive advantage. All our services are flexible and individual and at the same time meet the highest standards of the industry. We always strive towards transparency in operations and track regulatory and industry changes to provide products that comply with regulatory requirements. Moreover, we put a lot of effort into building a strong team of professionals in order to provide our best service. Since last year our team has grown by almost twofold. And this is not an extensive growth: we are concentrating more and more on the quality of our products by increasing the share of employees working in technical and quality assurance departments. We can’t deny the fact that the industry is becoming more sophisticated in terms of technology. Brokerage companies should keep the pace and integrate technology into business to provide better customer experience. Today some brokers still don’t use additional technology providing, their clients only with the standard capacities of the trading platform. I strongly believe that this will not be a choice for a future broker, but rather an indispensable prerequisite. Already now new investors are driven to the industry, first and foremost, by automated services such as, for example, asset management programs provided by a broker. Thus, now the industry is all about client acquisition and conversion by the means of technology and improved user experience. What new fields or opportunities do you see as holding growth potential in the market? Taking into account cases with data and technology breaches, I see the need in technologies bolstering security. Here I speak not only about security against cyber attacks but also about prevention of everyday risks faced by a broker. I suppose that market demands technologies on the intersection of big data and risk-management. Now when everyone collects a lot of data, we need a solution that will find linkages in data and track meaningful patterns in order to prevent any kind of damage, which could be caused by technology breaches, unexpected behavior, and human factors and so on.